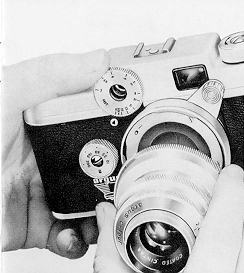 The easiest method to interchange lenses on your Argus C-4 Camera is as follows: Hold C-4 camera in the palm of either hand (with front of camera facing you) so that your thumb is on top of C-4 rangefinder wheel. Your index finger should be on back of camera, while your other three fingers grip base of camera. The purpose of holding your camera in this position is to allow you a firm grip on the camera and at the same time enable your thumb to turn or hold the rangefinder wheel, wherever required in the following instructions. Your rangefinder is a precision instrument. Whenever any lens is removed from the camera, be careful to avoid turning the rangefinder dial. To avoid damaging the rangefinder, NEVER turn dial more than 4 teeth beyond 3 foot mark or 4 teeth beyond infinity (oo) mark. 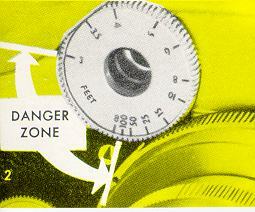 In other words, NEVER turn rangefinder so that the index mark on the body is pointing to any area in the illustrated 'DANGER ZONE'.